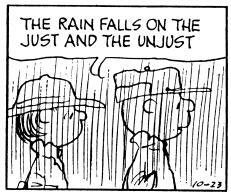 The rain falls on the just and unjust « Hercules and the umpire. My trial in Omaha went fine. That is except for the fact that I got smacked in the face with the flu or something like it. Long story short, it was all I could do to drag myself to court and back to the hotel. After the trial was over Thursday afternoon, returned home and went straight to bed. Friday, early in the morning, I had my port flushed, drove to work and spent the day sending people to prison while stuffing tissue up my nose to stop the bleeding from the blood thinner that I will take until the oncologist says stop. Slept from Friday evening at 7:00 PM until Saturday at about the same time. Chicken with rice consumed and then back to bed. Totally spaced off Valentine’s Day. Nine hours later, I am now awake again. Must prepare today for trip to Australia tomorrow. Have no idea where I will get the energy. Poor me. Taint fair. In the back of my mind, Matthew 5:45 of the King James Version of the Bible clucks back at me. “That ye may be the children of your Father which is in heaven: for he maketh his sun to rise on the evil and on the good, and sendeth rain on the just and on the unjust.” The bible always brings me such comfort. Hope you get your energy back and enjoy your trip! Thanks for this post. I was growing concerned about the quiet over here. Safe trip. True. But one would hope that the just get an umbrella every now and then. Safe travels. May the umbrella be with you. In that scripture, the sun and rain are both a blessing. People didn’t think of rain is something that ruined the weekend but as something that made their crops grow so they could eat. Have a wonderful trip to Australia. Maybe being down under will turn your experiences upside down and you will feel chipper. Seeing those adorable grandchildren should bring special joy and delight! Hope you feel better before you get on the plane. A 12-hour flight in coach with the flu would be awful. Enjoy the sun in Australia. You’ll be glad to hear weather down here is warmer this time of year, of course being upside down means that more fluid flows to your nose, so you have to take the good with the bad. Enjoy your travels here in the land down under. You should totally waste a day by going to one of these cricket world cup matches. If it rains, you could quote this line too.